Admire some of Taiwan’s finest natural landscapes on this private Yangmingshan National Park day trip from Taipei. 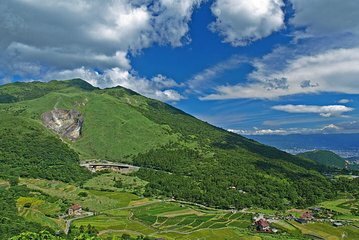 Travel into Yangmingshan National Park with your guide and enjoy fine views over the volcanic terrain. Visit local attractions including the Zhongshan Building in Yangmingshan and gain insight into the region’s heritage. After a traditional lunch, visit Xiaoyoukeng and learn of Taiwan’s volcanic geology. Follow hiking trails through bamboo forest to Yangmingshan, and discover sulfurous rocks and natural hot springs. Watch cattle grazing in Qingtiangang Meadow and admire serene views over Bamboo Lake. Unlike standard packages, this private tour comes with the flexibility to customize your itinerary. Die Tour hängt vom Interesse ab. Wenn jemand an der Landschaft interessiert ist, dann schon, aber sonst kann man sich das auch sparen. Der Tourguide war sehr höflich und freundlich und die Organisation war sehr gut.